Cerro Gordo, N.C. (April 19, 2018) – The last time Timothy Peters partnered with Ricky Benton Racing (RBR), the pairing resulted in a seventh-place finish in the NASCAR Camping World Truck Series (NCWTS) at the half-mile Martinsville Speedway. Emboldened by the result, the team and driver have decided to renew their partnership in a bigger way: RBR and Peters will be heading to Alabama to compete in the Monster Energy NASCAR Cup Series (MENCS) GEICO 500 at Talladega Superspeedway. 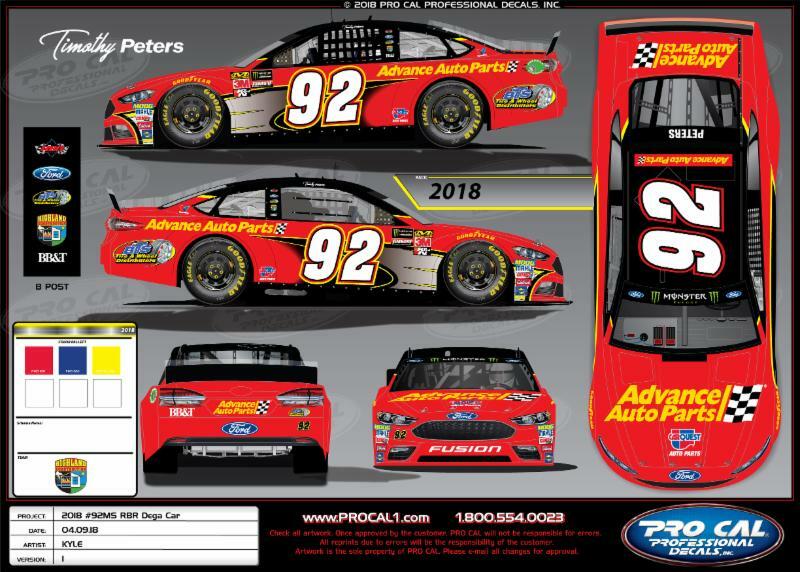 The event will be Peters’ debut in MENCS and RBR’s second start. RBR finished 14th in the 60th running of the Daytona 500 in February. “Timothy is an incredibly talented driver and proved to be a great fit with our guys at Martinsville,” said team owner Ricky Benton. “He and (crew chief) Mike (Hester) worked great together, communicated well and made some great adjustments as that race progressed. To learn more about Advance Auto Parts, a leading automotive aftermarket parts provider that serves both professional installer and do-it-yourself customers, www.advanceautoparts.com . Black’s Tire and Auto Service was formed as Black’s Service Station by W. Crowell Black in Whiteville, N.C. in 1929. Now, with 46 locations in both North and South Carolina, Black’s remains a locally family owned/operated tire sales, service and vehicle repair business. In addition to the retail and commercial locations, Black’s operates four warehouse/distribution centers, a commercial sales division operating out of those four locations and a tire-retreading business, Carolina Retreads. The Black’s Tire family includes more than 700 highly skilled service-minded team members and ASE certified technicians. To learn more about Black’s Tire or to find a location, visit blackstire.com . BB&T is one of the largest financial services holding companies in the U.S. with $221.6 billion in assets and market capitalization of $38.9 billion as of December 31, 2017. Building on a long tradition of excellence in community banking, BB&T offers a wide range of financial services including retail and commercial banking, investments, insurance, wealth management, asset management, mortgage, corporate banking, capital markets and specialized lending. Based in Winston-Salem, N.C., BB&T operates over 2,000 financial centers in 15 states and Washington, D.C. A Fortune 500 company, BB&T is consistently recognized for outstanding client service by Greenwich Associates for small business and middle market banking. More information about BB&T and its full line of products and services is available at BBT.com .